DORmino Mouse Mooches Off Your Hot Laptop | OhGizmo! I don’t know about your laptop, but the heat mine gives off could power a small industrial nation. Okay, maybe not, but it does a damn good job of toasting my pop tarts and rendering me sterile. 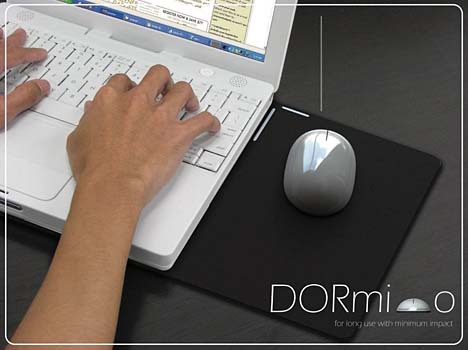 The DORmino mouse takes all of that wasted heat and uses it to power a wireless mouse, utilizing silicon nanowires embedded in a pad that sits underneath your laptop, a thermoelectric converter, and an induction coil inside the mouse to transfer power up from the pad. The mouse itself has a touchscreen scroller and a bluetooth interface, and the pad rolls up for easy portability. The design has been entered in the 2008 Greener Gadgets Design Competition, and if it wins, it looks complicated enough that it still probably won’t be produced, unfortunately. That laptop is an Apple Powerbook with WINDOWs. Impossible. It’s not an Intel chips!